This legendary bar is back in action, but is it as good as it once was? After an 18-month refurbishment, Address Downtown is back in business, with some of its popular outlets returning, and a handful of new venues to choose from. Thankfully, Neos is one of them. 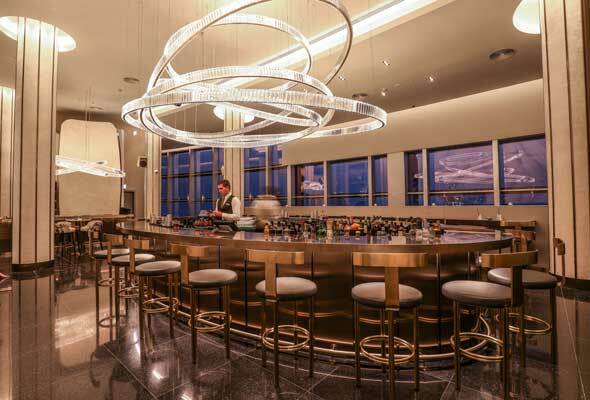 Perched high on the 63rd floor, Neos was one of Dubai’s most popular bars for wowing visitors. Now that it’s back with a brand new look, does it have the same draw? 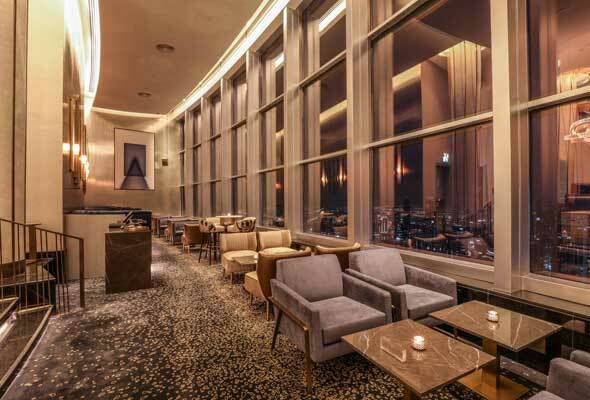 The core layout of the lounge remains the same, with a central, circular bar and high tables facing the entrance, while some small steps lead down to low level seating, which look out over Downtown Dubai. The crushed velvet sofas and dark coloured interiors that once aged the space have been replaced with more modern and neutral tones. It’s still pretty decadent though, and accents in gold and champagne hues from the leather booths and gold bar stools reaffirm Neos’ grandeur. The food menu is concise, a small menu of sharing plates that includes an oyster and caviar section, platters of cheese, meat and seafood, and heartier dishes such as grilled prawns and braised beef short rib sliders. We pick the signature meat platter to share (Dhs160), which arrives as a generous portion of three skewers of beef, chicken and lamb. The highlight is the beef – tender chunks of short rib glazed in a tasty barbecue sauce that slide effortlessly off the skewer. Delicious on their own, their flavours work perfectly with a light and fluffy potato cheese espuma. A second dish, the Glazed Black Pepper Beef arrives at the same time, simple portions of glazed beef are delicately plated with a side of extra thinly sliced potato chips. The unmistakable star of this show though, is the views. Floor to ceiling windows run along the back of the lounge, lined with low-level tables and outward facing booths. From each of the tables, you have a prime view of Burj Khalifa and its vibrant light displays, while 63 floors down you can admire the vistas of Burj Park, and the half hourly Dubai Fountain Show.